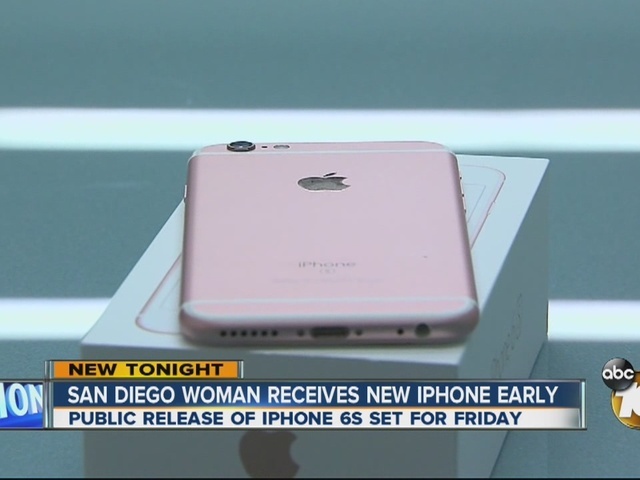 A San Diego woman may be the first consumer in the world to receive the iPhone6s. Adrienne Levin said her iPhone6s was delivered to her home Monday night, five days before the expected public release Friday. And since then, Levin has been inundated with questions about the phone, responding to Apple enthusiasts about what the product is like. She even ran a diagnostics test and posted its result so everyone could see. “People were asking for photos and videos and some of the 4K video because that's one of the new features,” said Levin. She said the improved video quality is her favorite feature, including the new 3D touch screen that can quickly pull up the camera or any other customized feature. According to Apple, the 6s has an improved camera, performance and a stronger cover glass. “I’m a huge Apple fan so it's not hard to talk about Apple products all day long,” she said. It’s still unclear if the early delivery was a mistake. 10News reached out to Apple for a comment, but they have not returned our calls.